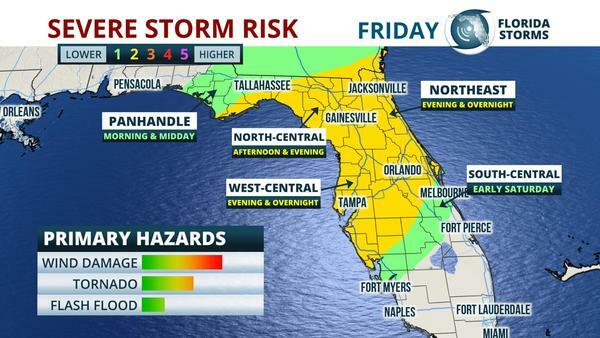 Severe thunderstorms, including the kind that could produce a tornado, are possible in northern Florida Friday, then across central sections of the state Friday night. Heavy rain could also prolong or worsen ongoing flooding concerns along several rivers in north Florida. The primary thunderstorm hazard will be damaging wind gusts up to 60 mph, although the strongest cells might also rotate and pose a tornado risk or produce hail. National Weather Service Meteorologist Ryan Jewell outlined a large area of north and central Florida as having a “slight risk” of severe thunderstorms, which is a level two on a scale of five, in his midday update from the Storm Prediction Center. The timing of the greatest risks is noted on the map above or listed in more detail below. The unsettled weather will come from a powerful storm system that is expected to develop over Texas Thursday, sending a cold front across the Gulf of Mexico Thursday night. Ahead of it, warm and humid air will overspread Florida thanks to a strengthening southerly wind. As the front arrives Friday, the air will become unstable and numerous clusters of thunderstorms are expected to develop. Although the degree of warming and instability is in question, upper level atmospheric dynamics are likely to be more than sufficient to support the risk of severe weather in some areas. This will be the third front in as many weeks to move through the Sunshine State, dumping heavy rain across sections of the panhandle and portions of North Florida. 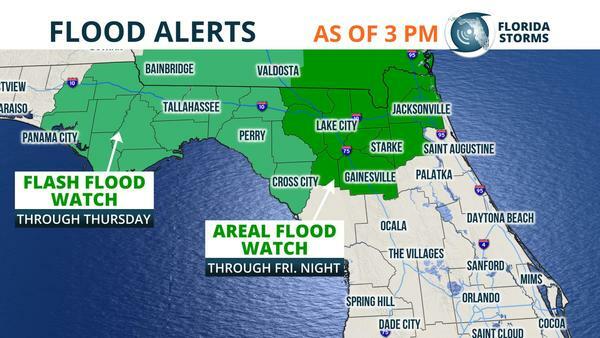 A Flood Watch has been issued for much of northeast and north-central Florida, where rainfall totals of two to four inches are possible through Friday night. Several rivers are already in minor or moderate flood stage, and forecasters at the National Weather Service in Jacksonville and Tallahassee have advised that Friday's heavy rain will likely produce additional flooding along their banks. Residents in flood prone areas near the rivers and counties listed below should be prepared to move to higher ground if local authorities advise to do so. The cold front will pass through the state Friday night, but the chance for lighter rain showers will linger in north and central Florida through Saturday morning. Drier conditions (and sunshine) will return to the Sunshine State Sunday, as the upper level low pulls away from the Southeast. Unlike the previous two storms, temperatures will not cool as much behind Friday's front because it's taking a different track. The air moving in over the weekend is coming more from the west, rather than the north, and will yield temperatures that are only slightly below normal for this time of year in most areas Sunday and Monday. Copyright 2018 WUFT 89.1. To see more, visit WUFT 89.1.